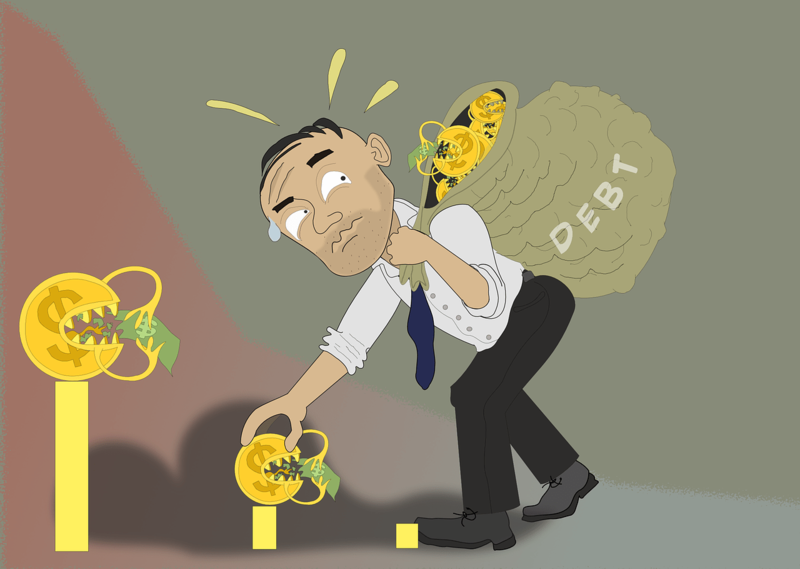 Debt is a word that can potentially become a nightmare for many of us. Living in the world means that you have to deal with financial activities. Every human being has to understand some basics of money management or personal financial management. Managing finance is the significant commercial activity as well. Most of the businesses take this aspect of business very seriously. Analyzing financial data and making important financial decisions are the keys to success for both businesses and individuals. Debt management is an integral part of managing a business or personal finance. When you have opted for too many loans from various lenders, you would definitely find yourself in an uncomfortable financial situation. To make essential purchases, where a lot of money has been involved, people generally opt for loans. Going for a loan is actually a good thing for making such vital purchases. It makes the process of purchasing a valuable asset simplistic. Nevertheless, you do not have to plunge into financial crunch after expensing a lot of hard-earned money behind it. Now, opting for a loan is a crucial financial decision. When you know you have enough economic stability to repay the loan, you should only opt for a loan in that case. People make errors in judgment when it comes to opting for various loans. Nevertheless, having multiple loans from various lenders is always matter of inconvenience. You can simply choose to go for debt consolidation loan. With debt consolidation loan, you can pay off the other loans. As a result, you shall have only one loan to deal with. It helps to make financial planning process simplified. Nevertheless, it turns out to be quite a cost-effective decision. It can save a lot of money for you. With conventional loans from different lenders, you have to pay high-interest rate. As a result, you have to make a lot of additional expenses due to high repayment interest. With debt consolidation loan, you can get rid of this and can attain better financial stability or sustainability. For debt consolidation, the most important thing is to find a suitable lender. For that purpose, you can simply opt for the options that are commonly available. In the following section, we shall discuss those probable options for obtaining debt consolidation loan. Here are those options for you at a glance. Bank Loan: Opting for a bank loan is the most standard way of debt consolidation. Banks offer debt consolidation loan at quite a low rate of interest. You need to make your application accordingly. Now, it has to be remembered that bank offers consolidation loan in two ways. They are loan without collateral and loan with collateral. Making a choice for the type of your loan is your personal level of convenience. When you have a low credit rating, going for a loan with collateral is the best thing to be done. Online Lenders: Various online based lenders are there, offering excellent debt consolidation loan. The repayment interest for such loan is definitely higher than the interest rate of banks. However, the good part is that getting such loans is easier. You can make an application online, and approval will be done after verification of application. You shall be notified via email of your loan application approval or decline. The amount of the loan may not be high through the process is convenient as well as time-saving. Private Lenders: Many financial institutions are there, offering excellent debt consolidation loans to the borrowers. Opting for the private lenders is always a good thing when the bank has not approved your application for debt consolidation loan. Different lenders have different terms and conditions. So, you should be careful about this aspect. Your credit score is the critical thing for debt consolidation process. You must have seamless credit score otherwise you shall not obtain the loan. Ideally, the credit score should be more than 600. Anything below this threshold limit value has been regarded as a poor or average credit score. So, you need to check your credit rating first before you apply for debt consolidation loan. If your credit rating is low, you need to adopt the following techniques to enhance your credit score. Increasing credit card purchase will bring a better chance of having a better credit score. You should pay bills on time – well ahead of the due dates. Track due dates of credit card bills and make payments in advance. Do not keep any loan premium unpaid. You should not sign up for a new credit card. Check out mistakes on credit report if anything is there at all. For debt consolidation loan, credit score plays the most crucial role, as good credit score will successfully bring bank approval for your loan. In case if credit score is below average, you have to go for loans from other lenders. Bad credit lenders are popular choices, though they offer loans with a high rate of interest. How beneficial is Forming an S-corporation? Many lenders feature zero-interest loans for debt consolidation. People get easily lured by such marketing tactic without knowing the deep meaning of such loans. When you find zero interest debt consolidation loans, you should read terms and conditions of the loan carefully. Reading the loan terms and conditions will help you to understand the complication of zero interest debt consolidation loan. Most of the credit card companies offer such loans. In most of the cases, zero percent has been referred to as the interest over the balance transfer. That means loan would be available on the repayment interest rates, but the balance transfer will be without any interests. When you find that you are not eligible for debt consolidation loan from the bank, you should check your eligibility for a personal loan. Basically, you can utilize the personal loan for debt consolidation process. The good thing is that banks offer personal loans at low repayment interest rate. However, the loan amount would be a little low. You make some good and fantastic points about debt consolidation loan that I never thought about.